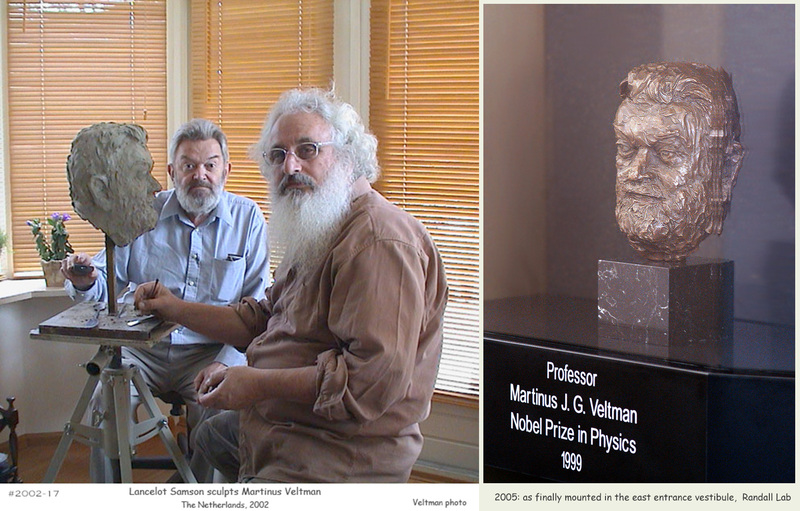 The 1999 Nobel Prize in Physics was awarded to Michigan Professor emeritus Martinus Veltman and his student Gerard ‘t Hooft for their profound contributions to the theory of elementary particles. The sculpture above, now (2014) in the Randall Courtyard, is in fact the third sculpture honoring Veltman that has been put in that location. The first, a bronze portrait bust was (as Veltman had predicted) stolen within weeks of its installation. Fortunately it was recovered not long thereafter but for security the bronze portrait was mounted within the east entrance vestibule of Randall Lab. This left the original limestone mounting bereft of adornment, this being a problem since Veltman (then retired from UM and living in the Netherlands) was going to make a highly-publicized return visit to campus in 2006. 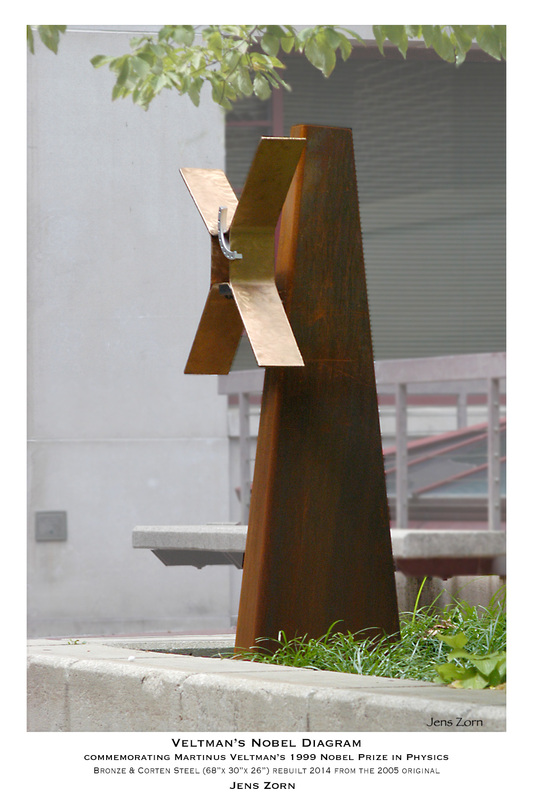 I proposed to use the then-empty mount in the Randall Courtyard for a sculpture in which diagonal arms call to mind the incoming and outgoing particles; the square structure in the center represents exchange processes between particles. The curved, steel arc derives from Veltman’s innovative method of calculating particle interactions. David Carter and I built and installed the sculpture in time for the visit. … but five years later it fell victim to an unfortunate move by a Hi-Lo bucket. 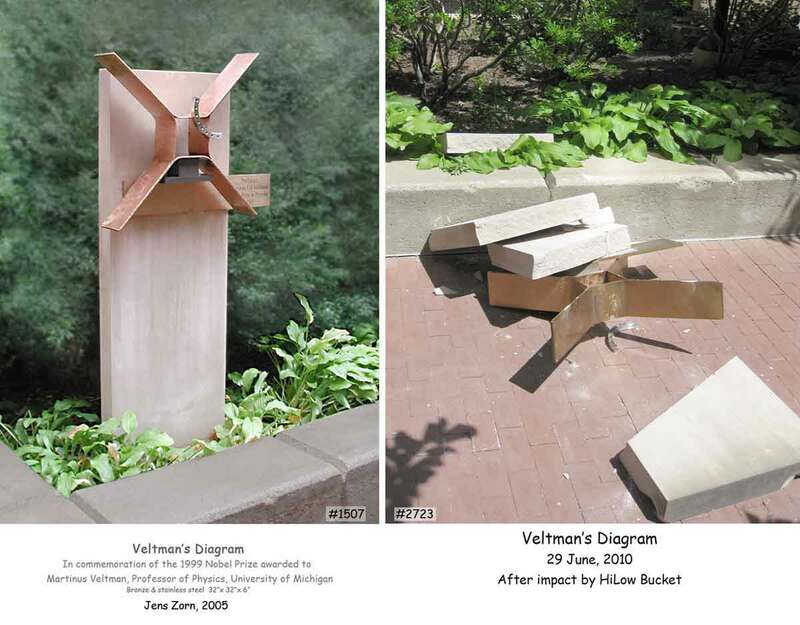 Delayed for the usual reasons for several years, we replaced the original limestone mount with a cor-ten steel support for the bronze Veltman diagram. The steel, left uncoated, soon acquired a dark, uniform patina as seen in the 2014 photo above. In May of 2001, Michigan Center for Theoretical Physics collaborated with Michigan’s School Art and Design in the inaugural conference of the Center That conference, entitled “2001: A Spacetime Odyssey”, included a show of installations and artworks held in and around West Hall . My contribution to this was to suspend a large [30 x 20 x 5 feet] aluminum tube construction high above the West Hall/Randall courtyard [Photo], this being evocative of the Veltman-Feynman diagrams used to describe the scattering of elementary particles. This installation was in place for about three weeks. The University President’s office, in 2003 under Lee Bollinger, arranged to honor Veltman with a portrait bust on outdoor display. That bust (by the Dutch sculptor Lancelot Samson) was installed in April of 2003. Veltman was in the Netherlands at that time, but upon seeing a photo of his bust on display, sent e-mail on 19 May: “…By the way, a sculpture like that right on the street would not live long in the unfortunately quite debased Netherlands. What about student pranks in Ann Arbor ?”. On 11 July the bust was indeed stolen; after some misadventures it was recovered about a month later and finally reinstalled 2005 in the safer location of the Randall Laboratory entrance vestibule.